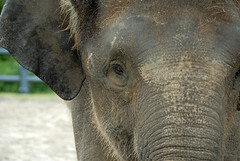 My sister had the chance to take photos inside the elephant pen a while back. The photos are great. We found out when we were accepting an offer on our home that it falls in the Kennedy School soaking tub privilege zone. D’oh! 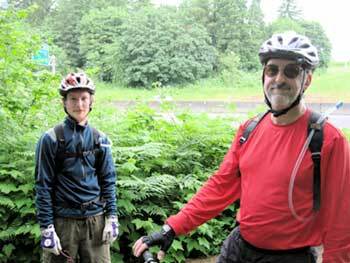 Joe, my dad and I rode a nice 50 mile ride on Memorial day largely following the 40 mile loop. We met at N. Vancouver and N. Killingsworth at 8 am and headed south to the river, then east on the Springwater corridor to Gresham. We made our first stop in Gresham, then took Kane Drive down to Marine Dr, where Joe was offered as a sacrifice to the flat tire gods. After a quick patch, we continued to I-205, where we ran the gauntlet on the 205 bridge in to Washington to check out the Vancouver side of the river. I can’t explain it, but the I-205 bridge seems to to only go uphill. For 1.5 miles. With 3 lanes of quickly moving traffic on both sides. Then, once you cross, the route along the Old Evergreen Highway is no comparison to the Marine Drive trail. Oh well, lesson learned. I think we all agreed that we felt rather good for having ridden a little over 50 miles, though we didn’t do much climbing. We’ll have to do some of that before STP. Which is in July. Soon. Apparently, calories and hydration are key. I’ll have to keep that in mind. Ella just crossed the entire living room to get to me. She’s starting to show some interest in the stereo too. That’s not good. We’re most of the way through the process of buying a home in NoPo and are gearing up to sell our current home. It’s really, really hard to leave this wonderful neighborhood, but the new place is closer to my parents, who care for Ella during the day. The move will reduce the amount of driving we do significantly (after the move, of course) and will hopefully be a great an experience as the last 2 years have been in our current home. If you’re on the market and like thai food, have a look. Artist Chris Jordan’s current work includes visual depictions of American life, enumerated. The stuff is fascinating on the web – I can only imagine what the installation must be like. A house fly just landed on my screen. The light from the screen shines through his abdomen revealing a seemingly hollow chamber with a spine down the middle. The fly seemed content just cleaning himself as I chatted with Matt, but then I got kind of annoyed at his bathing on my screen. I didn’t want to touch him, so I decided to pester him with the mouse cursor, which at the time was a link-rollover hand. Sure enough, it made the little bugger nervous and he started to move to avoid the pointing finger. Being a boy, and this being virtual-poking, I kept at it, and the fly flew off. Solving problems with technology. British Chemists have developed a plastic-based blood substitute that may work as a short term replacement for human blood in emergency situations. Cool stuff, but I’m rather fond of the free donuts when you donate on Thursdays. I’ve walked by this one so many times I don’t know how I missed it. Southwest corner of NE Emerson and NE 27th. Emerson is spelled with 2 M’s. The icing on the cake? The contractor stamp is misspelled too. My boys at Giebisch & Joplin should have had someone else doing the stamping. Maybe it was a disgruntled employee?